The eco-friendly Element hotel is opening in a LEED renovated building across from Baylor University Medical Center in Dallas in the fall. Courtesy of Atlantic Hotels Group. A LEED-certified renovated building in the Dallas medical district will soon reopen as an environmentally friendly boutique hotel. The Element by Westin is set to open its third North Texas location in a 100,000-square-foot building across from the Baylor University Medical Center in the fall. The former Dallas Health & Rehabilitation Center building was built in 1964 and has sat vacant for years, according to the Dallas Morning News. According to Konig, the building will receive basic LEED certification with eco-friendly practices incorporated into the Element design wherever possible. “Starting with our guest rooms, we use carpet that is made from 100 percent recycled content and low VOC paints on the walls,” said Konig. 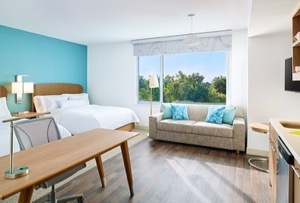 With 151 guest rooms, the hotel's green features include energy efficient appliances, reverse osmosis water filters and S’well water bottles that guests are able to use throughout their stay in order to reduce the use of plastic bottles. The propery's extensive recycling program will include bins located in every guest room as well as in the common areas of the hotel, making any opportunity to recycle hard to miss. While the property will not be zero waste, Konig stresses that Element strives to reduce the normal amounts of waste produced by a typical hotel. “We are partnering with our waste disposal vendor to provide us with detailed monthly reports showing our total tonnage both for waste and recycling,” she says. With the target demographics known as “healthy actives” - those travelers who like to stay balanced and active while on the road - Konig says the new hotel will also offer complimentary breakfast made to order from a curated menu available to all over-night guests with some vegan items offered like avocado toast, oatmeal, fresh fruit and cereal. "The whole mantra of our brand is about being eco-friendly, it's a lifestyle," said Konig. Dallas-based Atlantic Hotels Group owns two of the Element hotels in the North Texas area - the Element Dallas East and the Element Love Field locations. There is also the Element DFW Airport North, which has been popular due to its prime location. A fourth Element is planned to open in 2019 in Fort Worth, south of DFW Airport. Konig admits the Element brand lacks the recognition other brands have in the area. “It will be our duty to educate our guests and spread the word about our brand,” she explains. Perhaps it won’t be hard with so much to offer. There are a variety of room types, including ADA guest rooms. All the studio rooms have a kitchenette with microwave, toasters, refrigerators, dishwasher, plates, bowls and utensils. There is also 2,000 square feet of meeting space, complimentary bicycle lending, a fitness center and an indoor pool. Don't be fooled! Eco-friendly updates are redundant if while on your way to the recycling bin or fitness center you're getting complimentary WiFi radiation. Most of us are being radiated, 24/7, until we make changes to reduce/eliminate exposure. Electromagnetic radiation is zapping us -- from cell phones in our back pockets, from wireless equipment in our offices, from routers and iPads and smart meters and microwave ovens and tablets and game systems and baby monitors and cordless phones and thermostats in our homes, in airports and airplanes, restaurants and coffee shops, gyms, schools, libraries, hospitals, daycare centers, and (isn't it ironic?) green hotels and National Parks!